A Penske RS Spyder has taken line honours at the Sebring 12-hour, breaking a 20 year drought for Porsche, and an eight-year winning streak for Audi. The 10th season of the American Le Mans Series (ALMS) kicked off last weekend at America's oldest event, the 56th 12 Hours of Sebring race in Florida, USA. Its historic 5.95km, 17-turn circuit, which tracks around an old World War II air base, has for the last eight seasons been dominated by the Audi R8 and R10 racecars. But this year, a Porsche has claimed victory after a 20-year absence from the podium, and ended Audi's strangle-hold on the enduros. The Porsche RS Spyder of Timo Bernhard, Romain Dumas and Emmanuel Collard won the season opener with a relatively tight margin of 13 seconds, and the second, third and fourth place cars crossed the finish line on the same final lap. This is hardly unusual in a sprint race, but is an incredibly tight finish in a 351-lap, 2100km endurance haul. The Audi R10 of Rinaldo Capello, Allan McNish and Tom Kristensen crept onto the podium when the LMP2 Fernandez Racing Acura failed post-race scrutineering. The car, which had crossed the line in second place, did not pass a test on its mandatory air restrictor. Only air passing through the restrictor is allowed to feed the engine under LMP2 rules, so the engine should stall if the restrictor is blocked. When the restrictor was plugged in a post-race test, the engine kept running, which in turn disqualified the team. Second place was then awarded to the Dyson Racing Porsche of Leitzinger, Lally and Franchitti, making it a Porsche 1-2, and a clean sweep of the LMP2 class with the other Dyson Racing entry taking third in class and fourth overall. Fifth overall went to Australia's David Brabham, Scott Sharp and Stefan Johansson in a Highcroft Racing Acura, and sixth went to the other Audi R10. The Sebring track was covered in dust, with inconsistent weather and wind wreaking havoc on the track throughout the race. Twenty one cars from the 33 starters finished the race, with an average of one car per hour forced to retire. Both diesel Audi R10s suffered mechanical difficulties through the race, as did the new Peugeot 908 HDi. And the other RS Spyder of Sascha Maassen, Patrick Long and Aussie Ryan Briscoe were forced out on hour two due to overheating problems. The last time a Porsche won at Sebring was in 1988, when Hans Stuck and Klaus Ludwig clocked line honours in a 962. SEBRING, Fla. (March 16, 2008) - Porsche, the most storied name in the history of the Mobil 1 Twelve Hours of Sebring - America's oldest sports car race - added to its legacy Saturday with a double victory at the 3.7-miles airport course in Central Florida. Scoring its 18th overall win (Ferrari is second with 12 overall victories), Porsche combined with another classic name in motorsports - Penske Racing - as Romain Dumas (France), Timo Bernhard (Germany), and Emmanuel Collard (France) piloted their 3.4-liter, V8 Penske Porsche RS Spyder to a one-minute victory over the Dyson Racing Porsche. Bernhard and Dumas won 11 of the 12 LMP2 class contests in 2007 en route to last year's title, including six races overall. "This is a great win for Porsche Motorsport and Penske Racing," said Tim Cindric, president of Penske Racing. "To win the Daytona 500 and the Mobil 1 Twelve Hours of Sebring within four weeks is a tremendous accomplishment for our entire organization, and we are proud of hard work of drivers, crew, engineers and shop employees that contributed to these wins. This is the toughest road race of the year, and we had not won it on our previous two attempts, so this victory is extra special," said Cindric. The Porsche RS Spyder now has either a class win or an overall victory (or both) at every American Le Mans Series venue since the car debuted in October, 2005. "The race presented many challenges for both drivers and crew as we always had to decide between conserving fuel and maintaining a pre-determined pace, and charging ahead to catch up or extend a lead. Sometimes those situations changed from lap to lap, but Penske Racing was up to the strategy solutions, and my driving partners Dumas and Collard did their part on the track," said Bernhard, who has entered Sebring seven times in GT2 and LMP2, and had only won a single time. The team Penske Porsche of Patrick Long (USA), Sascha Maassen (Germany), and Ryan Briscoe (Australia) was running in the top three early in the event, but a broken water pump lead to overheating, forcing the car out of the race. It was the first time since its debut in 2005 that an RS Spyder did not finish a race due to mechanical failure. 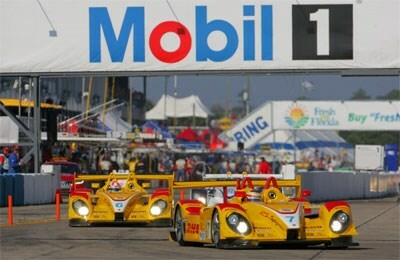 The next race for the American Le Mans Series is the Acura Sports Car Challenge of St. Petersburg.